A four-month constant supply of nutrients and is perfectly balanced for high vegetable yields and beautiful blooms on annual flowers. ideal for all types of vegetable gardens and annual bedding plants. Hang or pole mount 1/2 threaded pipe adapter and drainage holes in base to keep seed dry. powder coated aluminum six lexan seed ports and aluminium perches - completely rust proof. lifetime warranty against squireel dammage. attract song birds. 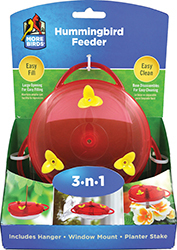 3-in-1 Platform Feeder 2" x 12-5/16" x 16-7/32"
Versatile platform-style wild bird feeder from Stokes SelectUse as a hanging feeder, ground feeder, or pole mounted feederAttract more bird species with this easy to fill and clean bird feederAmazing 3-in-1 platform feeder offers versatile feeding options. This multipurpose feeder from Stokes Select can be used as a hanging feeder, ground feeder, or mounted on top of a 1" diameter pole to attract a great diversity of wild bird species. Open, fly-through design allows birds to feed comfortably and avid birdwatchers to view birds from any angle. Metal construction with powder-coated hammered copper finish. Made of 100 percent recycled materials. The 3-in-1 Platform Feeder measures 12-5/16" x 16-7/32" x 2" high and holds 2 quarts of birdseed.Part of the proceeds from every purchase of Stokes Select Products goes to bird habitat and conservation.Add a squirrel baffle above or below your bird feeder for added squirrel protection.Please click on "More Information" for directions for use.